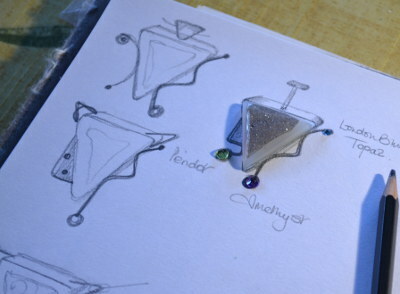 I left my career in the NHS in 2007 to fulfill a lifelong ambition to make jewellery. With the help of a groaning bookcase and a number of masterclasses with some of the country’s leading designer jewellers, I have progressed from selling at seaside craft fairs in Pembrokeshire to having my jewellery exhibited in galleries around the country. I still enjoy selling at high quality local exhibitions in Cardigan, Borth and St. Davids where I have the chance to talk about my work directly with customers. I have spent my life making things, from the earliest years of cutting holes in pieces of fabric to wrap around my dolls, through making my own wedding gown and now constructing beautiful and complex forms from precious metals and gemstones. Working predominantly in sterling silver, some pieces with gold highlights, I have developed skills in a number of techniques, both traditional and modern. I have a passion for surface texture – it is unlikely that you will find many smooth polished pieces in my collections apart from the odd gemstone ring – and I am an expert etcher, using this along with other methods to achieve interesting effects on metal which can become surprisingly tactile. My other passion is quality and I make and finish every piece myself, to the highest standards. Major pieces are usually one of a kind as I move on to the next idea. I enjoy adding hidden detail that remains a secret between owner and maker, such as a special detail on the reverse of a piece. 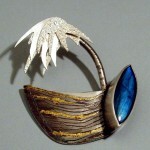 The transformation of flat silver sheet into ‘wearable art’ is a source of constant satisfaction. My new work uses environmentally friendly ‘Eco-Silver’ wherever possible. This is the same ‘925’ Sterling Silver quality standard but is refined from scrap silver rather than freshly mined silver ore. This arrives as silver sheet certified by my bullion supplier as ‘eco-silver’, or sometimes from my own ‘off-cuts’. West Wales is a wonderful area to live and work and the local countryside and coastline continually feed my creativity. Some of my collections are based on nautical themes, some inspired by the extremely well fed lazy birds in my quite unkempt garden where foxes, badgers and birds of prey are regular visitors. Other collections result from a more abstract journey through my imagination, ranging from a brooch featuring a spaceship circling a mouse-infested cheese moon to garden dramas such as a bird musing whether or not to take the last cherry (a small ruby) from a tree. If you do not find what you are looking for among the pages of this website, please do not hesitate to get in touch. Not all my work is featured here and I also enjoy working to commission to create a cherished bespoke piece to your requirements.